Happy Monday!! I know what your thinking, “Monday”… Blah!! I agree. I have a thousand and one things that I have put off all weekend to get to, but I’m trying to be optimistic. Especially cause the girls in my family, and a couple old friends, are going on a girls trip this weekend!! Which means I have to have my house completely in order so I can leave, but in being optimistic, I’m so excited for the trip!! We are off to Hollywood for a weekend of giggling, fun, and my sister got us into The Price Is Right!! Ah!! Should be so fun! I will let you guys know if by some stroke of fate, I actually get chosen. Cook shells in boiling water according to the directions on box. Rinse with cold water and set aside for later use. Lightly spray a 9 x 13 pan with cooking spray and spread 1/2 cup of pasta sauce evenly over the bottom of the pan. Set aside. For Filling: Stir together egg whites, ricotta, chicken, spinach, garlic powder, basil, and seasoning. Stir in 1/4 cup of mozzarella cheese and parmesan cheese. 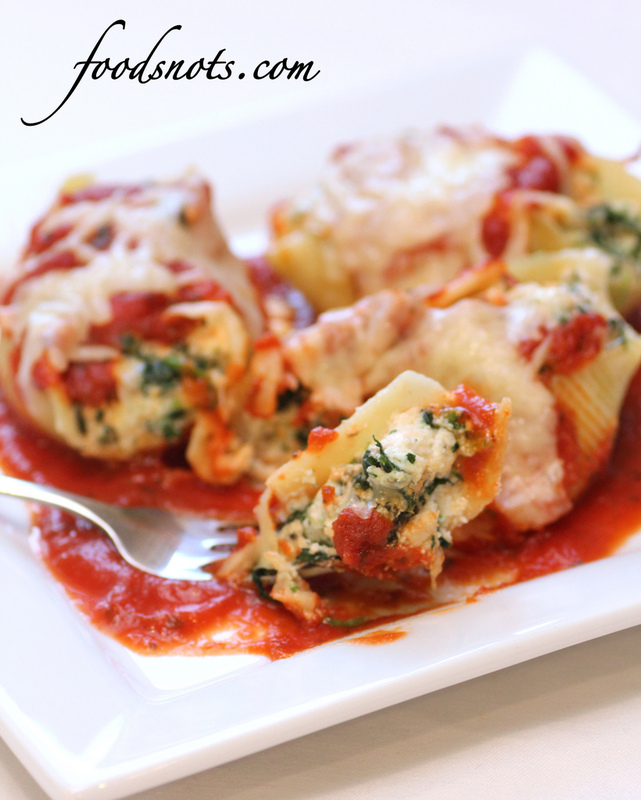 Fill each shell with mixture and place filled shells in the baking dish on top of sauce. Spread remaining sauce on top. Sprinkle with remaining cheese, salt, and pepper to taste. Bake for 30 minutes.